Taking their name from Greek mythology (concerning the curse of winter) and sounding a bit like early P.J. Harvey can't be a bad thing, I'm sure you'll agree, and so it is with five-piece band Demeter. Generating much dark and ominous energy, their grinding and screeching guitars emit the kind of insidious riffs that seep into the back of your brain and cannot be easily removed without resorting to surgery. Fronted by Seattle-born singer Anna Mercedes, backed by London-born electronic music innovator Andy Chatterley, Demeter began with studio work creating music that was, primarily, for themselves. "The thing which united us was our real need to make something different from what was going on around us. We were so fed up with the current music scene and the culture of audio force feeding." Formed about a year ago, Demeter's line-up is completed by guitarist Tony Haimi (from Finland), drummer Juan Toni (from Spain), and bassist Puter. The band's mainstream influences range from David Bowie and Kate Bush to King Crimson and Blondie. 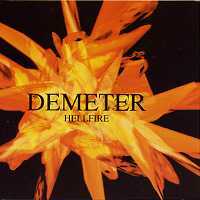 Demeter's self-titled debut album will be released autumn 2005. Their current studio-EP stems from the work of their live shows in London (Union Chapel, Hoxton Hall, Underworld and the ICA), where they deploy psychedelic multimedia effects and a dazzling blend of lighting design and fashion styles, visual aspects of their performance captured in the unsettling video (appearing as bonus material on this promo disc) for title-trackHellfire. Self-indulgence aside, the fearless band's first single Hellfire [the radio edit] features all the aggro and provocation of the legend of Demeter (mainly, of course, the vengeful blight against the Earth story, not the more charitable corn-culture festival schtick), with Mercedes' powerhouse vocals, Haimi's supercharged guitar work and Chatterley's suitably forceful electronic accompaniment. Dare You has a wonderfully bouncy and seductive rhythm, with nifty synth interludes supported by suggestive lyrics of corrosive debauchery sung right into your ear, closer than tinnitus - but rather more endearing, of course! Falling is largely a refreshingly downbeat-eclectic instrumental and has the subtly disquieting affect of auditory hallucination.